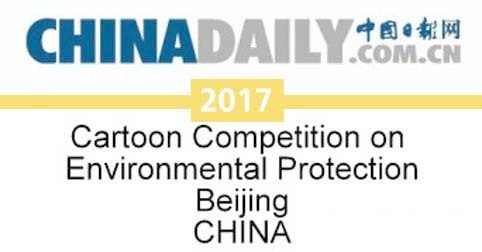 The 12th International Environmental Protection Cartoon & Illustration Competition was sponsored by the China Daily, the United Nations Environment Program, the World Wide Fund for Nature, the Ministry of Environmental Education Center, the China Environmental Protection Foundation, and the China News Cartoon Research Association. China Daily, 21st Century English-language newspaper and Xinmao.com's international comics competition. The current competition of the competition has started in December 2017. After one and a half months of manuscripts, more than 3,000 submissions from authors from thirty-four countries including China, Russia, France, the United Kingdom, Turkey, Singapore, and Greece have been received. .
After careful review by the judges, a total of 1 gold medal in the social group, 2 silver medals, 3 bronze medals and 50 outstanding awards were selected; 1 gold medal in the student group, 2 silver medals, 3 bronze medals, and 50 outstanding awards . "Using Clean Energy to Build a Better Home"
"Treasuring a bit of energy and creating a beautiful environment"
"A New Beginning" Kamil Jerzyk University of Marie Curie-Sklodowska in Lublin, Poland.